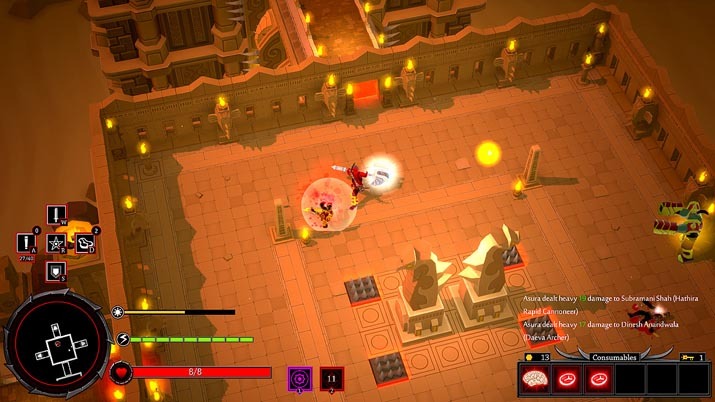 Asura is a roguelike inspired by Indian mythology with a focus on a hack-and-slash combat mechanic. The story begins with a cinematic that sets the backdrop. 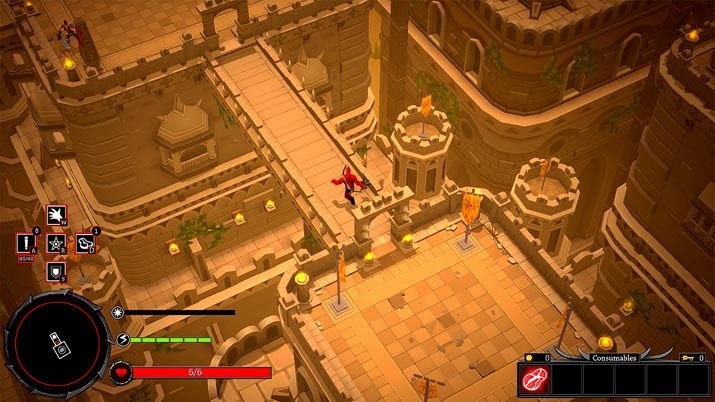 While watching, you may feel like you'll have to help save this kingdom in some way, or be some hero. Nope. Instead, your character is Asura, which, according to Indian lore, is a demigod; the name translates to "demon" from Sanskrit. Indeed, one look at this character brings up memories of playing the Diablo series. The voice acting during the opening cinematic and prior to each playthrough –although you can turn this off if you want to get right into the action –is superb and beautifully mastered. The developers may have added reverb to imbue the main voice with a bellowing, sinister tone. The beauty of the animation is also noteworthy, as are the graphics of the game itself – the style is evocative of Torchlight II. On the main menu, there are various choices you can choose, such as a leaderboard, settings, and so on. "Shastra" and "Aukaad" are essentially stat trackers, and display information, such as how many enemies you have killed, the bosses you have killed, and various abilities you’ve unlocked. There is some syncing issue, though: when I defeated a second boss, the number of different bosses defeated was updated, but the game did not reveal an extra box that showed this new boss. 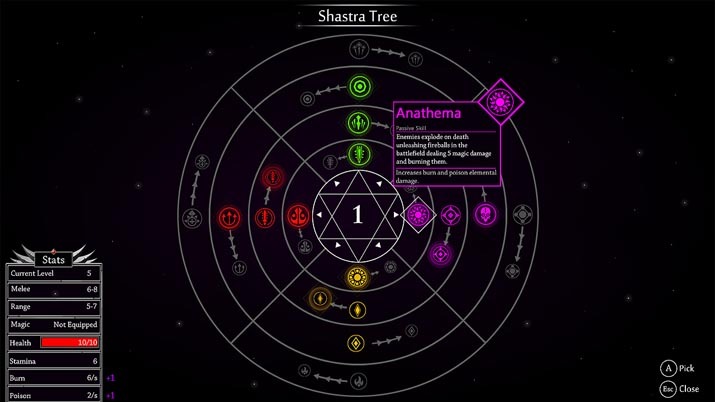 Within the Shastra, which shows these abilities, I quickly realized just how much depth there may be in these unlock systems. All told, Asura lists eighty-two abilities. It's overwhelming, and it took me a few moments to overcome the initial awe. But from that moment forth, the experience has been overwhelming - nearly stupefying - , exceeding expectations. The skill tree is procedurally generated so your build varies per playthrough, creating perhaps the most distinguishing feature of Asura. With each run, there is always a new challenge to face, strategies to implement and test, new foes to conquer. Beating a particular boss that defeated you a few times is fantastic, but don’t get your hopes up too much. A new, more powerful boss will assume the throne of the previous boss. There is a strong sense of strategy and skill in the combat system. There is a strong sense of strategy and skill in the combat system, as Asura implements a stamina system, which you consume when swinging a weapon (both melee and ranged) and performing evasive rolls. Not all weapons consume stamina: it depends on the weapon, and it seems that heavier weapons consume more stamina. You have to decide when to approach an enemy and attack, when to hide behind some obstacle and wait for the opportune moment or replenish your stamina, even when to use arrows for a ranged attack. Arrows are finite - you are given twenty arrows per run to use however sparingly (or not) you wish. Though you can use the occasional quiver to replenish this supply, the maximum capacity at the start of a run is twenty. Your starting health is likewise as low as your stamina, so be cautious during any skirmish. In later floors, there are some enemies that can kill you off in just a hit or two even if you still have a decent amount of health. Each run features five floors, and I imagine there awaits a final boss on the final floor. The only real progression you notice is how far you've managed to survive. Nothing carries over, so relying on personal skill and strategy, and refining these as you see fit, is a must. But, in the Aukaad (where stats and bosses killed are tracked), there is a progression value based on how much of Asura you have unlocked. This may be a turnoff for some, who enjoy unlocking some tangible benefits for subsequent plays, as is the case in Rogue Legacy, for instance, or even Our Darker Purpose. But, if you enjoy or do not mind how a title like The Binding of Isaac is set up, then you’ll likely have a similar sentiment toward this game. There are, however, just like in The Binding of Isaac, characters to unlock once you meet certain conditions. There are also harder difficulties to unlock once you beat the game on the current setting. Controls with a controller feel clunky at first (but keep in mind that Asura recommends playing with a controller), for the buttons on the directional pad are mapped to functions such as opening inventory, replenishing one’s stock of arrows if one has a quiver, and quick heal if one has meat. I think in other titles, the start button and maybe X would serve as a menu from which you can access the inventory and reload, respectively. You can remap some of the buttons to fit personal comfort; it just takes some getting used.